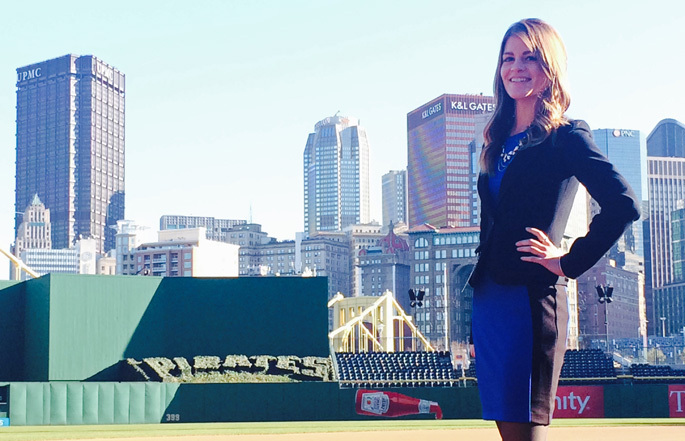 "Since coming to work for me at the Pittsburgh Pirates, I have come to know Samantha as a truly valuable asset to the marketing team and the organization as a whole. She is honest, responsible and has an impressive work ethic. Samantha is a true team player at the front office who is always willing to help where needed." "During my time at Point Park, I developed a strong work ethic and tried my best to take advantage of every opportunity I could to get experience and meet people within the sports industry." How did you land your positions with the Pittsburgh Pirates and Pittsburgh Penguins? A big part of landing my positions with the teams was just getting my foot in the door and then working my way up from there. During my time at Point Park, I developed a strong work ethic and tried my best to take advantage of every opportunity I could to get experience and meet people within the sports industry. This led me to an internship with the Penguins, and since then I've been in various positions within the organization. Similarly, at the Pirates, I started out part time in the ticket office in February 2015 and by the end of the baseball season, I was promoted to my current position in the marketing department. Tell us about the work you do for the Pirates. I have a variety of responsibilities within the marketing department, but I'd say my main job is to coordinate and distribute all of the Pirates marketing content seen on TV, radio, print, online, etc. I also write the scripts for our commercials as well as the on-air promotional content you hear during broadcasts. All of this involves maintaining good relationships with our media partners as well as working with them to execute various trade deals and promotional plans. How have SAEM classes and faculty helped you in this role? My SAEM professors were extremely accessible and always there to give me great advice about not only what was best for my career, but also for me as a person. They all have a lot of experience working within the sports and entertainment industries so the content of classes was extremely relevant and often featured great guest speakers who hold various jobs in the industry. The SAEM program as a whole gave me a ton of real-world experience that I don't think I could have gotten at any other school. Why did you decide to return to Point Park to pursue an M.B.A.? Returning to Point Park for my M.B.A. degree was a no-brainer because with the amount of hours I work, I knew that I needed a flexible class schedule and accommodating professors, which I knew Point Park had! The University also offers great financial assistance to returning alumni. My goal is to always keep learning, working hard and doing what I love! One thing that I've learned from professionals in this industry is that you truly never know where you might end up so doing your work with an open mindset can bring about wonderful opportunities that you never could've imagined.